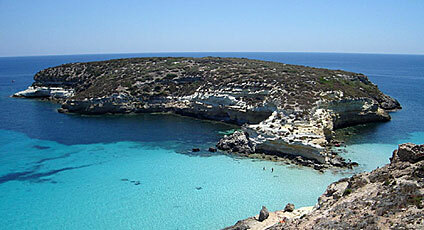 Lampedusa is the largest island of the Archipelago of the Pelagie, which includes two other islets, Linosa and Lampione. 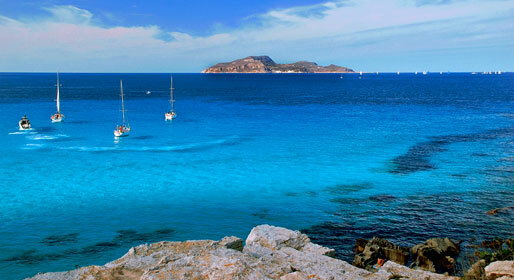 Lampedusa is principally a fishing town, with a large and well equipped fishing fleet. Its appeal lies in the coastline, and diving enthusiasts are able to enjoy unpolluted waters which are home to a great variety of marine creatures. Among the island's beauty spots are the stunning Tabaccara Bay, the Bay of the Madonnina, the Sacramento Cliffs, and the Albero del Sole, the highest point on the island of Lampedusa, from which one can enjoy the view towards the islet of Lampione and the Faraglione rock, the Scoglio a vela. The most beautiful part of Lampedusa has to be the Bay of the Isola dei Conigli; this bay resembles a Caribbean beach, with its startlingly white sand and turquoise colored waters; and it is here that one can find the striped lizard (Psammodromus algarus) and the Caretta caretta turtles. Not to be missed the Madonna di Porto Salvo.